Greetings everybody! Hope all is well out there. As I write this column, we find ourselves in the third week of some wonderfully warm and spring-like weather. It’s been great. It’s hard to believe that we’re already having to put a “3” in the date section of our checks, isn’t it? And as March comes, so does St. Patrick’s Day—one of my favorite celebrations. The old saying is that everybody’s Irish on St. Patrick’s Day. I’m actually part Irish so I have somewhat of a vested interest in this celebration. As far as I’ve been able to gather, my great, great, great, great-grandfather, James McCart, was the one who traveled from the Mother Country to the States. It was his son and my 3rd great-grandfather, William Marion McCart Sr., who brought his clan to the Covington area in the mid 1800’s by way of Abbeville , SC and Lavonia , GA. But that is another tale for another time; one that I plan to write about in a future column. So, what is St. Patrick’s Day exactly? It’s the celebration of St. Patrick, a 5th century A.D. Christian missionary who spread the good word and “cast out the serpents” from Ireland. The serpent bit is not literal or factual as it is believed that post-ice age Ireland never had any snakes. The serpents are more likely a symbol of the pre-Christian paganism and heathenism that gripped Ireland prior to Patrick’s arrival. More specifically, the Druids were the primary religious force in Celtic Ireland during this time. The Druids also acted as judges, teachers, and historians. They were also, unfortunately, the ones who carried out the sacrifices. 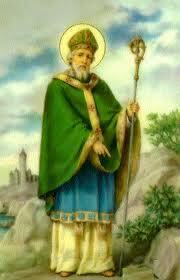 Patrick, by all accounts, was a great man and almost single-handedly turned a pagan society into a Christian one. The celebration enjoys much interest in the cities and areas of our country that traditionally have had a lot of Irish immigrants. 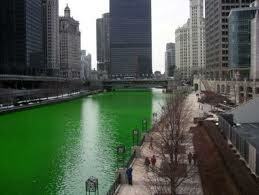 Boston , New York , Chicago , and other cities have large parades, green rivers, and lots of other festivities. Good ole Savannah , GA is known as one the best destination locations for those wanting to celebrate St. Patrick in the South. And as a quick aside, it’s not St. Patty’s Day—it’s St. Patrick’s Day! But perhaps the best part of this holiday, for me personally, is that it is a perfect opportunity to fix one of my all-time favorite meals—Corned Beef, Potatoes, & Cabbage. I’ve been told by a few folks that I make the best they’ve ever had, so I thought I’d share my recipe with y'all. 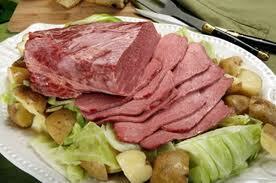 Buy yourself a corned beef brisket at the store. It will come with some seasonings. Get yourself a bag of new potatoes, 2 medium onions, and a head of cabbage. Some say you have to use carrots to make it a truly Irish dish, but I disagree. I love carrots in a pot roast, but not for this. I like to do mine in a Crock-Pot. Put it on high and fill it a little under halfway with water and add 6 oz. of Harp Lager and 2 shots of Irish Whiskey and throw in your brisket with the seasonings it came with. Then either quarter, third, or halve your potatoes (depending on how big they are) and throw them in. I’ll usually use 10-12 smaller ones or 6-8 larger ones. Add some of salt and pepper and let it cook for about an hour. Then cut up your onion and put that in with a touch more whiskey and beer (about a shot of the former & approx. 4 oz of the latter. Turn it to low and let it cook during the day while you’re at work. Then about an hour before you’re ready to eat, cut up your cabbage and put it in and add a touch more whiskey, beer, salt, and pepper. An hour later, and you're ready to eat. You can also do it in the oven at 350. Do the brisket and potatoes for an hour; then the onions for an hour; and then the cabbage for an hour. When you're ready to serve, remember to cut the meat against the grain. If you're industrious, you can Google the recipe for Irish Soda Bread to go with the meal. I just use loaf bread. 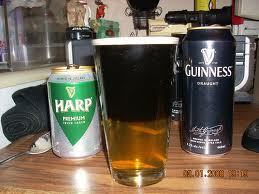 In terms of drink, I like to accompany my meal with Bushmills, either neat or on the rocks, and a nice “Half & Half.”—never to be confused with its more popular cousin, the “Black & Tan”, a ½ & ½ is created by pouring a half glass of Harp Lager and topping it with an equal amount of Guinness Stout. Happy St. Patrick's Day everybody! And remember to wear something green or you just might get pinched by a rogue Leprechaun!